I really don’t think this needs any additional comment, but I’m a writer, so I’ll make one anyway. I’m 46 years old. I’ve been trying to launch a writing career since I was 21. I am convinced that the only reason I have not published a book yet — the ONLY reason — is doubt. Or, by another name, fear. Don’t doubt yourself. It’s a waste of time, and you’ll never get that time back. Not ever. You can do it. People who are far worse writers have done it. 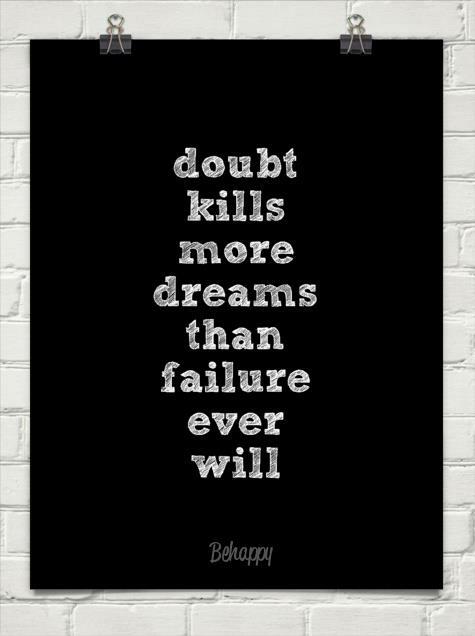 Don’t doubt yourself. You can do it. § 3 Responses to Don’t doubt yourself. No truer were ever spoken. You are currently reading Don’t doubt yourself. at Kicking the Pants.